Add Cost Plus World Market to your favorites! Mother's Day with free shipping! Don't forget Mom! 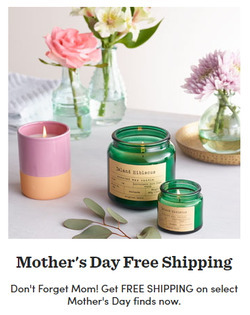 Get FREE SHIPPING on select Mother's Day finds now. Cost Plus World Market is always a fun place to explore, even if you're not shopping for anything in particular. They import beautiful and interesting items from all around the world, as well as selling products made in the U.S. Whether you want wine and food, gifts, or furniture and home decor, you'll be able to find it here. Do you want to receive more deals from Cost Plus World Market by email?